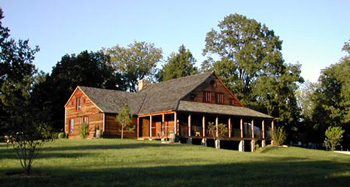 The Dana Brown Overnight Center (DBOC) is a cluster of historic log or post-and-beam structures dating back to the 1800s. They were originally located at various sites within 100 miles of the Shaw Nature Reserve. All of the historic buildings were carefully dismantled and reconstructed at the Center. Many of the modifications to the buildings used salvaged materials. Construction was completed April 2003. The Center is designed to accommodate a wide variety of groups. Overnight facilities can handle group sizes from 15 to 60. When school groups are not using the site, this is an ideal setting for retreats, workshops or corporate meetings. Daytime capacity is a maximum of 100. Using inquiry and standards-based science and math concepts, teachers and students have unique opportunities to enhance classroom learning with field investigations in the natural world. Reserve staff team with teachers to design comprehensive two- to five-day programs for their students.